Non-persistency is becoming more common in virtual desktop deployments and for a number of different reasons. In this talk I will explain the concept and its application, discussing Federal government non-persistent deployments from a cyber-security perspective and how non-persistency is used by UCLA to help their students get the resources they need. 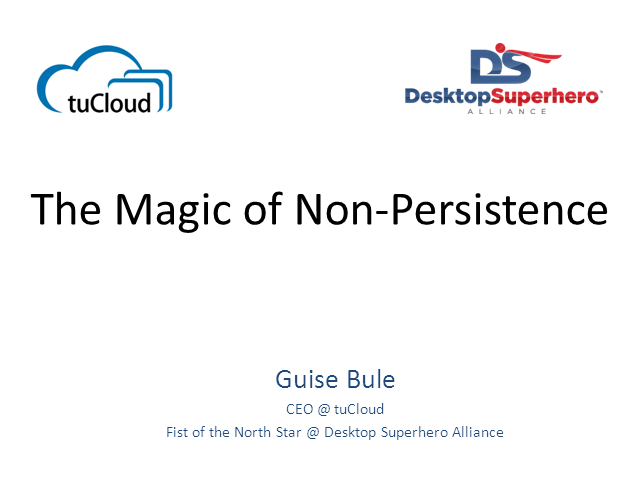 Finally, I will be talking about the magic of a non-perisistent desktop that uses persistent (virtualized) user layers to provide a persistent experience to its user, the magic being that the user never knows that their desktop is a non-persistent one.